This is a post I wrote for the S-CASE project blog. S-CASE or Scaffolding Scalable Software Services is an EU funded FP7 project I am currently working on as a technical coordinator. The post below describes what the project is about. The S-CASE project is about semi-automatically creating RESTful Web Services through multi-modal requirements using a Model Driven Engineering methodology. The world of web services is moving towards REST and S-CASE aims at facilitating developers implement such web services by focusing mainly on requirements engineering. The figure below depicts the basic components and basic flow of events/data in S-CASE. Analysis class diagrams to improve the accuracy of the system to identify entities, their properties and their relationships. The requirements are then processed through natural language processing and image analysis techniques in order to extract relevant software engineering concepts. These are mainly the identification of RESTful resources, their properties and relations and Create-Read-Update-Delete (CRUD) actions on resources. All these concepts are stored in the S-CASE ontology. The above procedure also identifies action-resource tuples that can be created automatically by the system like the action-resource “create bookmark” (automatically built) or others that need more elaborate processes like “get the weather given geolocation coordinates” (semi-automatically build or composed). The latter are send into the Web Services Synthesis and Composition module. The Web Services Synthesis and Composition module tries to synthesize elaborate processes by composing 3rd party web services into a single S-CASE composite web service. 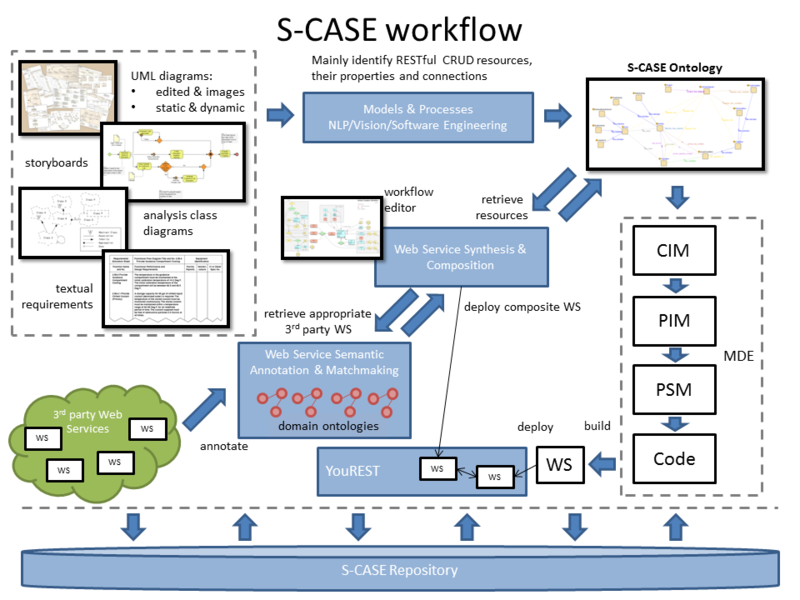 To perform such a computation, S-CASE provides a methodology for semantically annotating 3rd party web services using S-CASE domain ontologies, so that they can later be matched to the requirements of the composite service. The composite service is deployed to the YouREST deployment environment and registered in the directory of S-CASE web services for future reference and re-use. Upon completing the stages above, the model driven engineering procedure initiates. The first step is to create the Computational Independent Model (CIM) out of the S-CASE ontology. The CIM contains the bare minimum information needed to scaffold a REST service that adheres to the requirements imposed by the user, i.e. it includes all the problem’s domain concepts. After that model transformations take place transforming the CIM into PIM (incorporate design constraints, but platform independent) and PSM (Add support for implementing the PIM into a specific suite of software tools like: java, jax-rs, hibernate, json, jaxb, postgresql etc.). The final step is to automatically generate the code of the web service. Calls to composite services are wrapped inside the generated code. The code is build and deployed to YouREST for others to use. In order to support software re-use, every software artifact created from this procedure is stored into the S-CASE repository for future retrieval. Through S-CASE we plan to develop an ecosystem of services, along with the appropriate tools for service providers to develop quality software for SMEs with an affordable budget.